Reproduction is authorised provided the source is acknowledged. Alex Botsis is responsible for all errors... You are invited to follow twitter.com/sir_alex89. Following the 5th review of the IMF and Athanasoglou (2011, Chart4, p.11) on "The role of product variety and quality and of domestic supply in foreign trade" it is more than obvious that Greek firms are the largest importers. That is to say, Greece imports, heavily, factors of production other than labor. So, if Greece's non-labor production factors come from abroad, their prices are, also, set abroad... Therefore, the Greek firms may find it rather difficult to reduce their costs - no matter how labor cost might (?) be reduced - since the non-labor costs are set abroad. With firms finding difficult to reduce their costs, they will, subsequently, find it difficult to reduce their prices. This is a reason why prices did not deflate as wages did, so far, and why the the trade balance ameliorated mostly by the reduction of imports following the contraction of income and economic activity. Most likely, the overall mix, following the Greexit and the devaluation of the New Drachma, will be the following: reduced household income, higher prices and limited gains for competitiveness. Σύμφωνα με την 5η Έκθεση του ΔΝΤ και του Αθανάσογλου (2011, Chart4, σ.11) με θέμα "Ο ρόλος της ποικιλίας των προϊόντων και της ποιότητας και της εγχώριας προσφοράς στο εξωτερικό εμπόριο" είναι περισσότερο από προφανές ότι οι ελληνικές επιχειρήσεις είναι οι κυριότεροι εισαγωγείς. Δηλαδή, η Ελλάδα εισάγει, σε μεγάλο βαθμό, συντελεστές παραγωγής πλην εργασίας. Έτσι, αν οι παραγωγικοί συντελεστές (πλην της εργασίας) στην Ελλάδα προέρχονται από το εξωτερικό, οι τιμές τους, επίσης, καθορίζονται στο εξωτερικό... Ως εκ τούτου, οι ελληνικές επιχειρήσεις θα δυσκολευτούν να μειώσουν το κόστος τους - παρά το πόσο θα μπορούσε (;) να μειωθεί το κόστος εργασίας - δεδομένου ότι η το μη μισθολογικό κόστος καθορίζεται στο εξωτερικό. Με τις επιχειρήσεις να δυσκολεύονται να μειώσουν το κόστος τους, θα δυσκολεύονται να μειώσουν και τις τιμές τους. Αυτός είναι και ένας λόγος για τον οποίο οι τιμές δεν ακολούθησαν την κατακρήμνιση των μισθών, και γιατί το εμπορικό ισοζύγιο βελτιώθηκε κυρίως από τη μείωση των εισαγωγών μετά την υποχώρηση του εισοδήματος και της οικονομικής δραστηριότητας. Το πιο πιθανό, λοιπόν, είναι ότι το συνολικό μείγμα, μετά το Greexit και την υποτίμηση της Νέας Δραχμής, θα είναι το ακόλουθο: μειωμένο εισόδημα των νοικοκυριών, υψηλότερες τιμές και περιορισμένα κέρδη σε ανταγωνιστικότητα. 2014 Self-Assessment: Not bad at all! I am not trying to brag or something (ok, I feel proud that my studies and efforts proved somehow fruitful), I did not do something exceptional but to implement what I have been taught! I invite you to see this assessment in defence of existing Macroeconomic framework; it might not be 100% correct and accurate, but it is not rubbish either! Deflation: An Intermediate Exercise, of Febr. 24, 2014: To the bull's eye for deflation!!! "In conclusion, deflation is more likely to appear in the Eurozone than in the US, and any ECB action will find it difficult to tame the inimical price developments. Intermediate Macroeconomics models are not that bad in the end, are they?" But mistaken to Euro depreciation " Secondly, interest rates (both expected and realized) abroad are also close to zero and we should not expect any depreciation to enhance exports even more"
Effects of recently announced QE, remain to be seen. Preliminary Macro: Rising Euro-zone Trade Surplus is Good or Bad News?, of Aug. 20, 2014: 1] "the increased trade surplus simply shows that in the Eurozone we are slowing down but not shrinking": Correct; no recession in the Euro Area for the last semester of 2014.2] but, in the end I messed it up "recession is imminent, if you ask me, the third one in the last 6 years"; no recession so far. The failing "success story"... of October 15, 2014: Again, to the bull's eye!1] "Anyway, as I wrote a few months earlier the borrowing cost was, is and will remain prohibitive for a very long time. Until we raise adequate budget surpluses to finance our debt obligations, including annual interest payments, we cannot cut all ties with the IMF. Why particularly the IMF? Because, our Euro partners will find it hard to convince their tax payers to fund us even more, and the markets know that. "2] "considerable political unrest is about to unveil"
From Reuters "UPDATE 1-ECB's Nowotny: Greek banks can get funding even if deal not agreed"
Other blogs posts are opinions and comments, to my recollection. 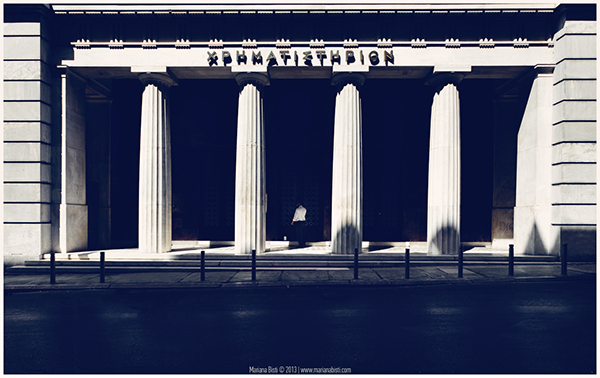 Greek Credit Institutions: Liquidity constrained? Following the decision of the ECB about the eligibility of the Greek bonds, I was initially panicked, too. However, after Karl Whelan's post things got straight. On Sep. 30, 2014 the outstanding repo transactions - MRO, LTRO - with the Eurosystem (ECB & BoG) was 10 bn EUR; that is the Piraeus Banks had, at that time, absorbed liquidity of approx 10 bn from the Cebtral Bank - so, not that dependent after all. Collateralized funding from the Eurosystem was 9,7 bn as of Sep. 30, 2014. On Sep. 30, 2014, funding from the Eurosystem ("Term deposits" of "Central Banks") was 12.6 bn Euros. Finally, as far as the Asset-Backed securities Purchase Programme of the ECB is concerned, Greek Banks cannot participate with their mortgage loans (see here), with the exception of mortgage loans with the highest of the second-highest rating. Overall, the four systemic Greek Banks seem to have adequate collateral to access the ECB refinancing operations; ECB liquidity provision operations. Note: Greek government debt owned is, perhaps, that low because most of it has been sold as part of repos with the Eurosystem for refinancing purposes (MROs, LTROs). So, Mario Draghi said that an inflation much lower than 2% is against his mandate. And it is! If you ask me, early 2015 is the right time, if not too late, to buy sovereign bonds. Let me, please, tell you what I think. Moreover, given that we remain below our potential output, member states have begun to deviate from austerity and call for more expansionary budgets. Sooner or later, they will start creating budget deficits as a mean of expansion. And this has two implications. The first one, which relates to my previous argument is that budget deficits will boost expansion, and, hence, the return to the potential output. Therefore, the later the ECB decides to act, the more probable the inflation becomes. Following this scenario, should the member states decide to move to budget deficits, this will increase the cost of their funding. Especially for the periphery, the effect would be disproportionate to that in the rest of the Eurozone. So, an intervention of the ECB would lower this cost, and would make budget deficits, i.e. recocery, cheaper. In other words, ECB and Eurozeone members will share, so to speak, the costs of tackling deflation. Finally, monetizing sovereign debt without triggering hyperinflationary pressures would be ideal. Eurozone's overindebted economies will be able to take a breath, and continue with structural reforms without the necessity of more painful budget cuts. Structural reforms can be more easily pursued when economic activity flourishes. Overall, since member states will start diverging from the austerity dogma, ECB will have to act before its policy risks becoming inflationary, to make budget deficits cheaper, to reduce debt burden, and to make structural reforms easier. All while tackling deflation as its mandate demands. Asset values have been rising somehow intensively, following amid liquidity injection (QE) by major Central Banks over the last few years. A controversial, yet rather effective, policy choice. And this controversy, currently, derives from the asset bubble argument. In other words, the increase in the value of assets is a bubble, and, inevitably, it will burst. Is this policy controversy well justified? Perhaps, not very well. I will not argue whether asset inflation is a bubble or not. That is not the point I am trying to make. I will argue, however, that the rising asset values is exactly how the whole policy should work! It is a key mechanism of transmitting monetary policy to the real economy. Not only for banks, but for households, as well. If you own assets, their value rises your net value rises, too, and, hence, you can borrow more or/and at a lower cost. Most importantly, households and businesses can remain solvent while deleveraging stops, and their liabilities rise. However, there are a few shortcomings. Firstly, increasing asset value may indicate a broken transmission mechanism; cheap liquidity is used for stock purchases instead of financing consumption and investment through lending. Again, that is also good; asset value rises, increasing net worth etc. Even if the transmission channel was malfunctioning, the above stagnation price and GDP growth, in the US, suggest that this channel has recovered and is working. All in all, this controversy over QE and the day after it, has some valid grounds, but waiting for the Armageddon has not. For the US, price inflation is good, growth is good, end of QE cannot go bad, so don't worry too much, please. This is how it is supposed to work, this is how it worked. While French Hollande is ready to negotiate for pro-austerity, "fiscal consolidation" if you will, others take serious steps for the best of the entire Eurozone's interest. Mario Draghi is (claims to be) ready to take bold action against deflation threat (Reuters), and Matteo Renzi publicly denouncing budget cuts in a recessionary environment (Le Huffington Post). Both are in the trenches with Berlin. At the same time, the rest of the leaders are conspicuous by their absence. I do not know anything about politics, but while the "fiscally sound" Eurozone failed to ram unemployment, an actual human index, the US did far more better job. The "cost" of fully recovering from recession was an approximately 9% of GDP additional debt burden for the US. Hopefully, Euro leaders will realize that unemployment is far more important than fiscal soundness, before it's too late! Anyway, as I wrote a few months earlier the borrowing cost was, is and will remain prohibitive for a very long time. Until we raise adequate budget surpluses to finance our debt obligations, including annual interest payments, we cannot cut all ties with the IMF. Why particularly the IMF? Because, our Euro partners will find it hard to convince their tax payers to fund us even more, and the markets know that. Added to the enormous borrowing cost, considerable political unrest is about to unveil. Naturally, after almost five years of continuous social turmoil - increasing unemployment, poverty, social exclusion, income losses - it would be naive to expect political stability. If you ask me, I do not believe that we are going to roll back; its the over optimism that will be cracked down by the markets. So, if you were one of those expecting a much better 2015, please, reconsider. Hopefully, it will be a little better... Deflation from abroad will shadow any higher growth momentum. P.S. : You may read the "Recent Developments" section (paragraphs 4 to 13) of the "Fifth Review" of the IMF, and judge by yourselves how "over" the over optimism has been. More about "Greece and the IMF" here.